Jawaharlal Nehru Stadium (JNL) was abuzz with thousands of Airtel Delhi Half Marathon (ADHM) enthusiasts who had reached the venue early this morning to run the 21.097-km race. NMA rules hindrance to development? 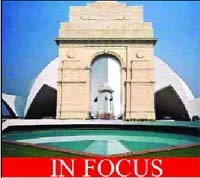 Acknowledging the problems being faced by several states because of the stringent provisions of the National Monuments Authority (NMA) Rules, 2011, efforts are being made to streamline the process of granting sanctions and non-objection certificates for constructions around historical monuments, said senior officials of NMA. After two robberies in ATM in the past two consecutive days, including the sensational daylight robbery of Rs 5.5 crore on Friday, one ATM of the State Bank of India was destroyed late last night, after it caught fire in the Rani Bagh area, North Delhi. The ATM was loaded with lakhs of rupees. 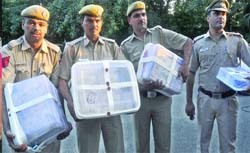 One person allegedly involved in the Rs 5.25 crore heist in Defence Colony, South Delhi, has been arrested, the police said today. Deepak Sharma, hailing from Haryana, was picked up for questioning from a South Delhi locality yesterday and was placed under arrested today, said sources in the police department. A large amount of cash was recovered from him. The police also seized a firearm from his possession. Braving the hot and humid weather, Kenya's Edwin Kipyego emerged victorious in the men's elite category while Ethiopia's Yimer Wude won the women's title. Kipyego covered the distance in 1 hour and 55 seconds to pocket USD 25,000. Yimer Wude touched the finishing line in 1 hour, 11 minutes and 10 seconds. Competing with Kipyego, Leonard Langart and Silas Kipruto finished the race with second and third, respectively, positions. While in women's category, Waganesh Amare and Helah Kiprop clinched the second and third positions. Indian performances were also quite encouraging, with Rahul Kumar Pal breasting the tape in 66.12 minutes to win the category. His overall ranking was 16. Nitender Singh followed him two seconds later while Indrajeet Singh sprinted to finish one second later in 66.15 minutes. In the Indian women category, Sudha Singh emerged the fastest to complete in 79.34 minutes, while former winner Kavita Raur came in second. A total of 31,746 runners participated in the marathon, which had a total prize money of USD 2,10,000. "I knew that the competition will be tough and weather will be humid. I started my training only two weeks ago, which is not enough. However, my experience in the recently-concluded Open National Athletic Championship helped me to finish first," said Rahul, a middle-distance athlete. Rahul said he would continue his training for the 5000m and 10,000m races as half-marathon is not in his mind. "I am happy to win this marathon, but my focus is middle-distance running," he stated. In the women's section, 2010 Asian gold medalist Sudha Singh stole the show from two-time ADHM champion Kavita Raut and defending champion Lalita Babar. "I had not practiced well for this marathon and was also upset after the result of the 2012 London Olympic qualifiers. But this result has given me some relief and joy," she added. The leading women ran almost together till 12 kms, after which they pushed hard for the podium finish. One of the main contenders, World 10K Bangalore 2012 winner Monika Athare suffered a cramp in the middle and could not complete the race. The strict provisions of the NMA rules has made it compulsory for all states to obtain approval before carrying out any civic activity within 300 m of a historical monument. The rules have aggravated the problems for several states like Himachal Pradesh, Uttar Pradesh, Gujarat and Madhya Pradesh, which are seeking revision in the provisions as these have become hindrance in carrying out developmental activities like construction, repair or alteration work in and around the 300 m of any protected monument without prior permission of the NMA. The Himachal government had written to the Central government, expressing concerns over the peculiar situation arising due to the provisions of the NMA stating that these are turning out to be against the spirit of culture and heritage of the state. The Himachal state Assembly had also passed a unanimous resolution on December 21, 2011, that the provisions of the act and the rules be amended for the hilly state. "We agree that the process needs certain modifications and we are already working in that direction," said NMA member Meera Dass. The NMA was formed as a result of the amendments made to the Ancient Monuments and Archaeological Sites and Remains Act (1958) last year and deals with any kind of activity around a protected monument. "Complaints or suggestion from the states are being looked into. We are still in the process of establishing a full-fledged system,'' said Dass, citing that the agency has not even completed one year. She clarified that the rule was formed to prohibit any encroachment or illegal movement near heritage sites or protected monuments. A computerised system will soon be in place so as to make states enable to send their applications and objections online. "This will reduce the communication time and help in taking up things on a fast-track basis. We will also create a central pool of documentation accessible to all states. The NMA is working to facilitate more information sharing between the Central government agencies and local communities in which heritage structures exist," said Dass. The authority is framing bylaws for allowing development around protected sites and structures. "We are laying down of guidelines to tackle critical cases. We have just finished making up of 13 varied cases or situations which will be taken up as examples while deciding on building bylaws. It is a very complex and vast subject which involves several complications," said Dass. Officials of the Delhi Fire Service suspect a short circuit in the ATM to be the reason behind the incident around 10.30 pm. It took an hour to douse the flames. According to the police, a youth Munavvar, who came to use the ATM, called the police control room (PCR) about the fire. "While coming out, he saw sparks in the machine. "Two fire tenders and some water tankers were pressed into service and the situation was brought under control by 11.30 pm," a fire official said. The value of goods lost is being ascertained. Just yesterday, robbers had made an attempt to break into a State Bank of India branch in Sarai Rohilla. The failed break-in, which police said was executed late on Friday night, was discovered when staff of the bank turned up on Saturday morning. "The bank manager called the PCR at 9.15 am, reporting that someone had demolished a portion of the wall located at its rear," a senior police official said. The footage from CCTV camera installed inside the branch was scanned and revealed three-four people barging into the bank around 1 am. "The robbers can be seen trying to unlock an ATM placed inside the bank, but they could not match the correct code which apparently foiled their attempt," the official added. The sources said that some more people have also barging picked up for questioning in connection with the incident. Armed men had on Friday looted Rs 5.25 crore from the van carrying cash for the ATMs and fled after shooting a guard. Four men in a Hyundai Verna car had intercepted the Maruti Eeco van carrying cash in the upscale Defence Colony locality around 1 pm, dragged out occupants of the vehicle at gunpoint and shot one of the two security guards who resisted them. Investigators believe that the robbery might have been planned by a gang based in Faridabad district of Haryana.